Ascending Butterfly: Turkey Day is almost here, but your #Health & #Fitness shouldn't suffer! Get a @BuluBox #SubscriptionBox & stay focused! Turkey Day is almost here, but your #Health & #Fitness shouldn't suffer! Get a @BuluBox #SubscriptionBox & stay focused! With Turkey Day almost upon us and most of us dreaming of our annual Turkey Day Coma, I thought I'd mix it up and remind everyone that you don't have lose your health and fitness progress just because the biggest day of eating is upon us. Stay on track with a Bulu Box! Things have been super busy, pretty much the state I live in lately, BUSY, in the province of No Time and the cross street called No Sleep Boulevard! So of course now that we are in November I am sharing my October box, yes it's been one of those months again! Let's dive into this box in alphabetical order! Ƹ̵̡Ӝ̵̨̄Ʒ - Barlean's CoQ10 Swirl - I don't want to scare you just before the holidays butterflies, but with Heart Disease being the number one killer of women, heart health is something it's never to early to start thinking about! An ounce of prevention is certainly worth a pound of cure. Coenzyme Q10 (known on the streets as CoQ10) is found in every cell of the body, our bodies make it and our cells use it to produce energy. The energy our bodies need for cell growth and it also functions as an antioxidant which protects the body from cell damage. You can find it in a variety of foods like organ meats such as heart, liver and kidney as well as beef, soy oil, sardines, mackerel and peanuts. It is said to help fight heart failure, cancer, muscular dystrophy as well as periodontal disease. It helps boost energy and speed recovery from excercise. I'm a strong believer in using supplements to fill in gaps in the diet, and the sample size I received was literally perfect, I kept it in my purse and added it to water, easy peasy! Ƹ̵̡Ӝ̵̨̄Ʒ - BiPro Whey Protein Isolate - BiPro is one of the purest whey protein isolates available worldwide and is used by Olympic Athletes World-Wide and contains NO protein blends or unwanted ingredients. It does contain all of the essential amino acids and is rich in branched chain amino acids (BCAAs) which are metabolized directly into muscle tissue and is currently available in Unflavored (perfect to mix into your own favorite recipe or in skim milk) as well as Chocolate and French Vanilla. Ƹ̵̡Ӝ̵̨̄Ʒ - nuviaCafe - Healthy Coffee? Nuvia, the healthier cafe is a Sumatran Arabica coffee that is infused with extracts of Ganoderma, ECGC, African Mango and Pomegranate; yielding a full-bodied and boldly flavor coffee that supports healthy energy (isn't that exactly what you want coffee to do in the morning anyway? Give you energy), supports immune health and also offers an appetite suppresant. That's quite a bill for a simple cup of joe don't you think? Ƹ̵̡Ӝ̵̨̄Ʒ - Sleepy Beans - As a lifelong insomniac anything that offers the promise of helping me drift off to sleep quickly and easily certainly gets my attention. I also thought the name was kinda cool too! Sleepy Beans have 3 ingredients for support of restful sleep, 5-HTP (this increases the body's level of serotonin), GABA which decreases neuron activity and stop nerve cells from over-firing (reduces your stress levels), and Melatonin which helps promote normal sleep patterns to help you establish more restful and relaxing sleep daily. I probably needed more than a sample packet to truly test its efficacy, I wish there had been a full size bottle of this one in the box that's for sure! Ƹ̵̡Ӝ̵̨̄Ʒ - Smarty Pants Adult Complete + Fiber Multi + Omega 3 + Vitamin D - Bulu box never fails to delight me with these gummy adult vitamins, anything that helps making healthy choices more fun is a total winner in my book! (and OK I have a bit of a sweet tooth so these appeal to me on several levels!) This is a full multivitamin with OMEGA 3s (EPA & DHA), Vitamin D3, Vitamin B12 and soluble fiber. What it doesn't have? NO High Fructose Corn Syrup, Artificial Colors, Sweeteners, Flavors or Preservatives, and they offer both adult and kid versions! And if the health benefits and fun way to take it wasn't a sell? How about a good old fashioned chance to do good by supporting a brand whose mission is to 'Get Health Give Health' and they do so by being a supporter of Vitamin Angels, for every bottle of Vitamins you buy, they give to children in need. They also support Turn the Tide and Charity: Water. 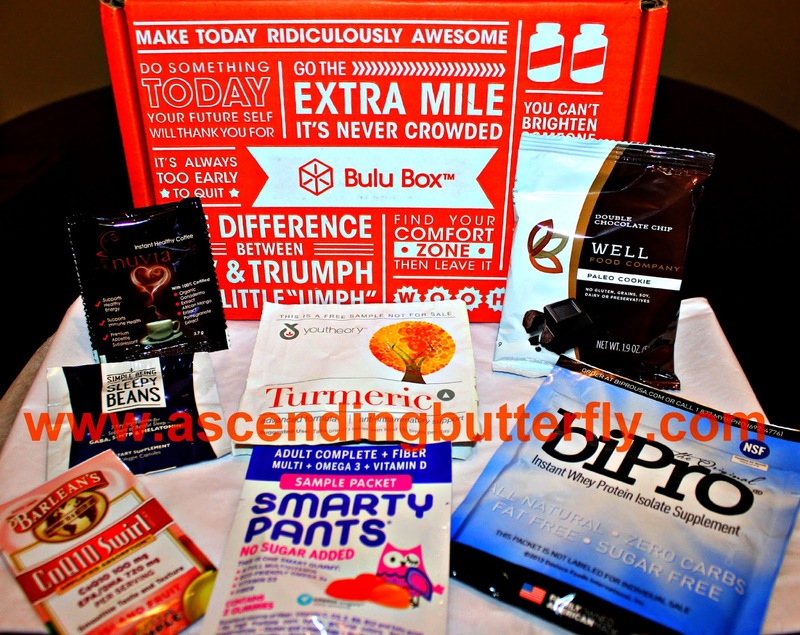 Ascending Butterfly has always supported brands that give back, and I am so glad that BULU Box included Smarty Pants in my October box! Ƹ̵̡Ӝ̵̨̄Ʒ - WellFood Double Chocolate Paleo Cookies - While I personally am not on a strict Paleo diet, I know it's hard for those that are to find 'treats' to fit into their diet/lifestyle, these Double Chocolate Chip 'Cave' Cookies are dairy, gluten, grain and lactose free yet still rival the taste of the real thing! I still haven't changed my writing habits and still tend to write during graveyard hours which tends to make me peckish late at night (the worst time to be snacking) so these are great for me to have at my desk so I can avoid late night trips to the fridge as I write. Ƹ̵̡Ӝ̵̨̄Ʒ - YouTheory Turmeric Advanced - Turmeric which contains curcuminoids (a group of specialized antioxidants), is known to support healthy inflammation response, with 95% curcuminoids with a protective coating this dietary supplement offers immune support and is enhanced with a patented black pepper extract that increases and enhances the bio-availability of curcuminoids. I like to cook with Turmeric, it has quite a few medicinal properties including: natural antiseptic and antibacterial useful in disinfecting cuts and burns, it has been shown to prevent prostate cancer and stop the growth of existing cancer, may prevent melanoma and also stop existing melanoma cells, it is a natural liver detoxifier, can prevent and slow the progression of Alzheimer's by removing amyloyd plaque buildup in the brain, it is a natural painkiller that also aids in fat metabolism and helps in weight management and it has been shown to stop the growth of new blood vessels in tumors! Ƹ̵̡Ӝ̵̨̄Ʒ - Join the Bulugan Nation, Nab a box at a 50% discount by entering code: BULUGAN707 - HERE! This was a well-curated box with products that definitely resonated with me, I love my dietary supplements so the Multi-Vitamin Gummies by Smarty Pants was a hit, and the fact that they also give back a definite bonus, I did use the Turmeric right away as well, and of course the sleepy beans as sleep is something I don't get nearly enough of, and of course I would love to see more Chocolate Chip Cookies, treats are something that you can feel very deprived of when trying to change your diet, so getting healthier snack options each month is something I definitely look forward to. FTC Disclosure: A Bulu Box has been provided to Ascending Butterfly for Editorial Consideration. As always, all opinions are my own. I am disclosing this in accordance with the Federal Trade Commission 16 CFR, Part 255 - Guides Concerning the use of endorsements and testimonials in advertising, you may check our Giveaway and Disclosure Page for additional information regarding Ascending Butterfly Disclosure. What a cool subscription box! This is the first time I've seen a box totally devoted to healthy products like this. I haven't tried the Bulu Box yet. I think it's perfect to get right before the holidays, just so you don't go totally off track with health! Thanks for introducing me to Bulu Boxes !! I think I need to try some of the healthy coffee. I am a caffeine addict, so might as well get some benefits. I've heard really great things about Bulu Box. So cool! Such a great idea and way to keep healthy! I love Bulu box. Always good items. I've never heard of this before. It looks like it is filled with lots of great things! These all look like great picks. Amazon has great prices as well. I have heard good things about Tumeric. I would want to try that first. The sleepy beans sound interesting. Am curious about how they work! I haven't tried the Bulu Box yet. I think I could use some sleepy beans. Very cool subscription box. I hadn't heard of this one before.